One of the biggest trends in the fashion world at the moment are the embroidery patches, no doubt. They’re on jackets, shorts, bags, shoes and the best part is that even if you can’t find the right piece that you want or you don’t know how to embroider, you can find so many pretty patches online. In this article we are showing you ten different ideas on how to embroider on clothes or shoes. Some of these include iron – on patch applications, while other require sewing skills and a machine. It’s up to you to find the one you like the most and let out the creativity! Bomber jackets are such a huge trend this season! They are really gorgeous and are an essential piece of clothing for everyone who likes to upgrade their street style. What we also see as huge trend is the embroidery patches. Hearts, letters, signs… They all look cute! 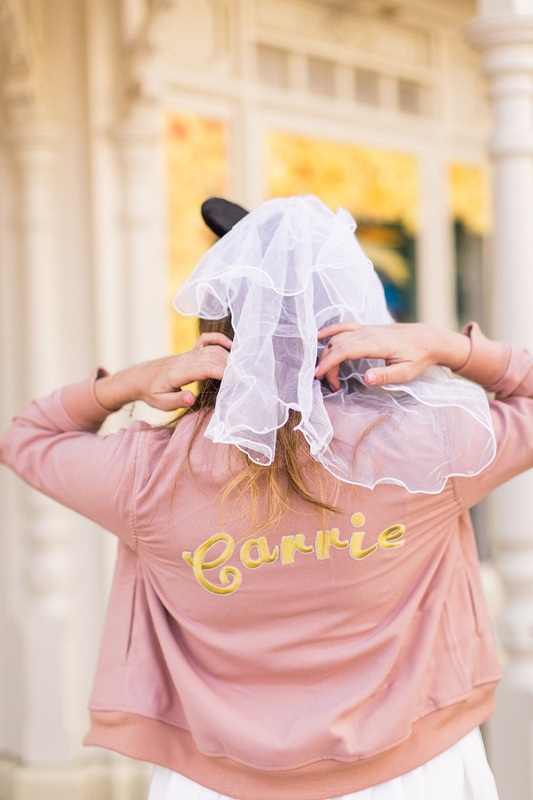 In this case, we have “Carrie” patch that you can sew your own or buy it online. If you go for the second option, you just need to peel them off, position them on the jacket, place a damp cloth and use iron upon it. Who would have thought that regular, white canvas shoes can be turned into colorful and wonderful embroidery? We fell in love with them the moment we’ve seen them. If you want to try this one out, here’s what you need besides the white canvas shoes – embroidery floss, beads, scissors and embroidery needle. 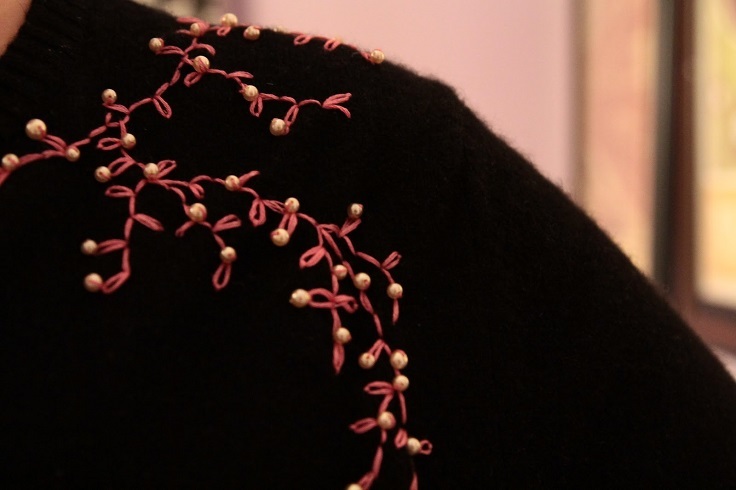 This project might take you more time, especially if you’re new at embroidery and sewing, but it’s definitely worth the try. Looking for a way to upgrade your white t-shirt? 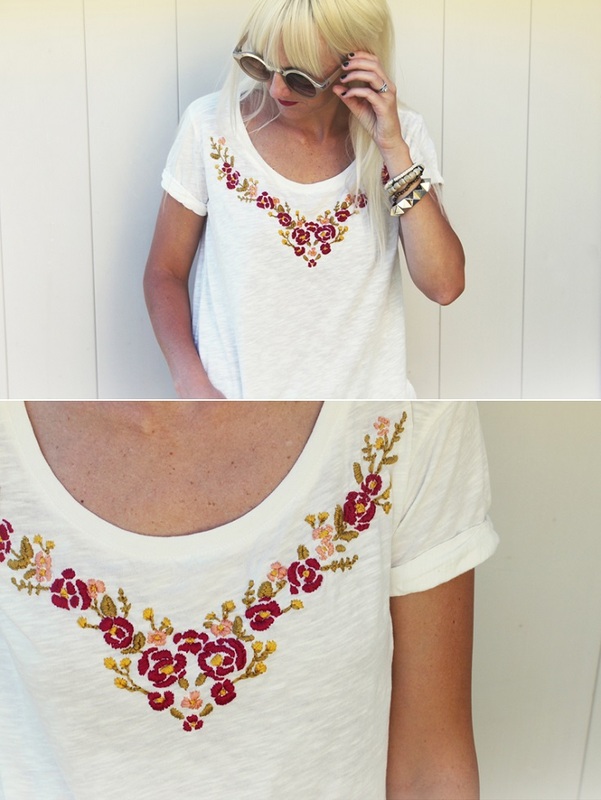 Well, how about embroidered flowers – the floral theme is always a good idea! For this project, you need embroidery thread, embroidery needle, washable marking pen, embroidery hoop and a basic tee. When it comes to the design of the floral pattern, you can sketch your own or check out the website below the picture and download the same one from the photo for free. Wow, patches sure look amazing on denim, don’t you think? Again you will have two options – two sew it yourself or use iron-on applications. However, the needle and the thread might prove to be a better options because it will hold the patches longer. Either way you choose, your jacket is going to look like an expensive, designer jacket. It’s awesome how a small DIY project can make things look more expensive! 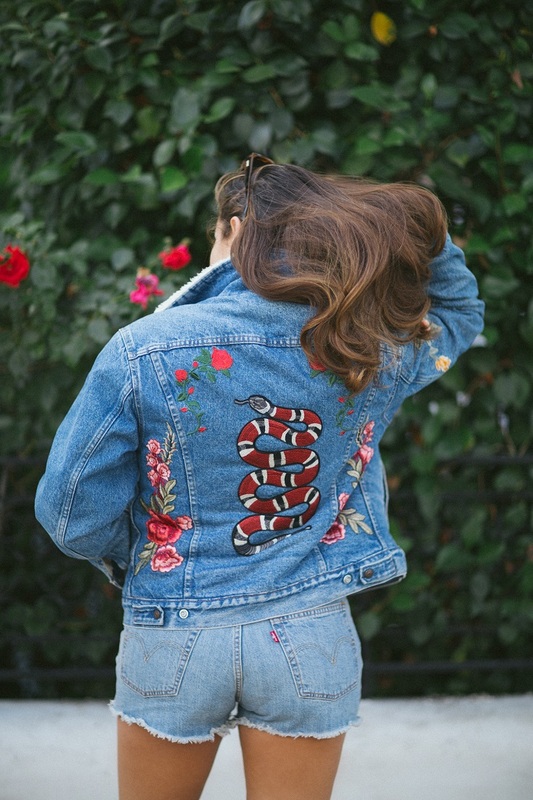 Here’s another way you can embroider denim. It’s about words and quotes! 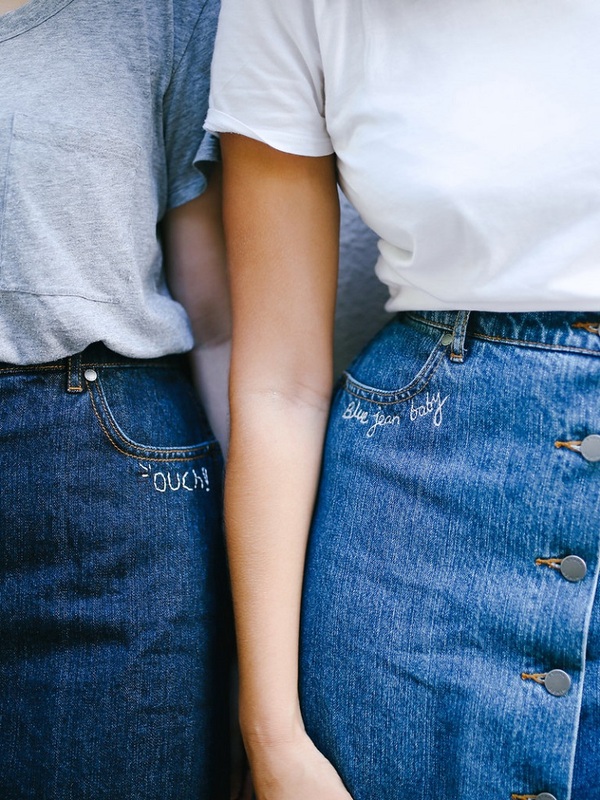 It is simple – looking, but very adorable way to decorate a denim. There are two ways you can embroider denim like this – either by hand or by machine. If you go for the first option, you need hand needle, thread and scissors or thread clippers. For machine embroidery you’ll need sewing machine, a free-motion sewing machine foot, thread and scissors or thread clippers. This is a whole DIY dress, not just the embroidery and it looks so nice! Adding a little color on a white dress is really a good way to decorate. To make your own dress like this one, you’ll need 2 yards white fabric, embroidery thread (you’ll need two of each color to make the neckline and hemline), thick needle (with an eye big enough to thread the embroidery thread through it) and a white thread. We all know how good is the feeling when you’re walking in shoes that you find exrtremely beautiful – especially when you know that it is you who decorated them! If you have an old pair of espadrilles that you want to throw away, think twice. Adding embroidery is a nice way to refresh the look and make them appear as brand new. 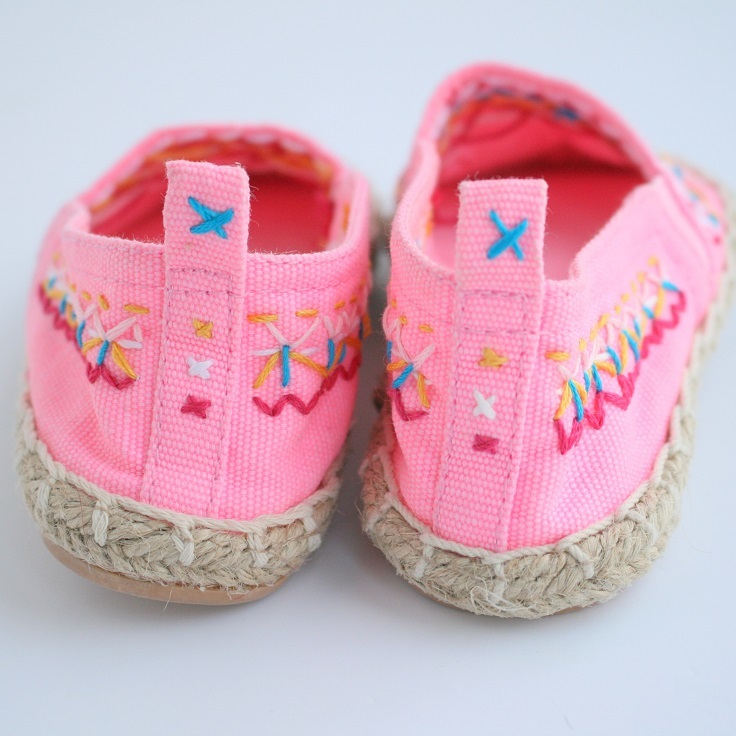 For this project, besides the espadrilles you need embroidery threads, needle, scissors and pencil. When studs are not enough, add some embroidery and like in this case, be inspired by Wonder Woman! For this project, you need a measuring tape, scissors, ruler, marking chalk, star patches and star nailheads. You can have your shorts done, or even get an old pair of jeans and cut them to the length you want your shorts to be. The shorts are going to be the perfect piece for the next summer or if you live where is hot all the time you can wear them right away! 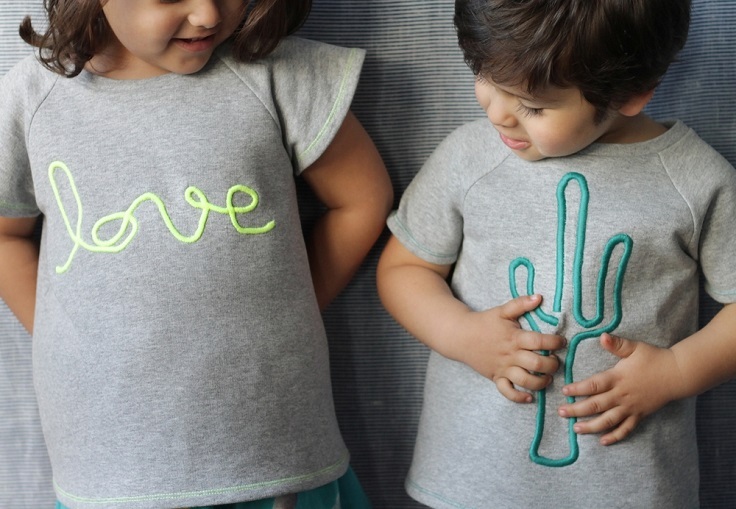 Aren’t these extremely adorable shirts for children? They are really minimalistic, yet have a design that will make you wish to have the same shirt for yourself! These shirts are even great for a gift. If you’re up for a birthday party and you don’t want to buy something really expensive, and you have a sewing machine – then you know what to do! With winter on its way, it’s time to buy new cardigans or take the old ones out. Either way you choose, you always have the possibility to add something and make it look so much better. If you like the embroidery on the photo, here’s what you need for it – plain cardigan, skein of embroidery thread and a needle, handful of seed beads and tailor’s chalk or fabric marker.